It all started with the idea, parents participating with their children. Land of Make Believe’s founder designed & built with the dream of providing affordable Family fun. No longer would parents be “passive spectators.” They would, in fact, “be kids again,” having as much, if not more fun than their children! Since 1954, we have been exceeding expectations in a clean, safe, and wholesome environment. Once a dairy farm, the founder transformed a beautiful valley into a charming, magical location. Knowing the cost of raising children, he encouraged families to bring their own food and enjoy picnicking in our special picnic grove. Land of Make Believe has food, too. Great hot dogs, hamburgers, french fries, chicken, pizza, milkshakes, lemonade, soda, and of course, the best ice cream. All at very reasonable prices. Guests tell us we have the best French fries and homemade fudge. Land of Make Believe is for all ages. All ages of children, all ages of adults. Plan a fun day at the Land of Make Believe. We have it all. 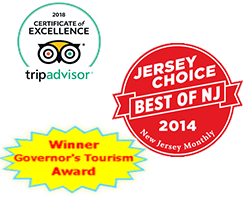 Amusement Park, Waterpark, Low Prices, Short Lines, Free Parking and Incredible Family Fun. We're less than an hour from NYC. Hope, NJ Rt 80 Exit 12.